Respected and trusted consumer watchdog Which? has recently conducted a survey of 18 laser eye clinics in the UK. This included high street clinics, small independent clinics and hospital based providers. According to a recent article in the Daily Mail, Which? were highly critical of high street chains. The consumer group found that one in three providers were not completely honest when explaining the risks. They were also found to be often misleading with pricing. Many providers, especially high street chains, were building in hidden costs. This included the leading high street chain in UK laser eye surgery. The information was gathered by researchers visiting a clinic several times. The data was then collated and discussed before they published their findings. So, as a small independent clinic, why did Advanced Vision Care do better than our high street competition? Eye tests and history taking were all satisfactory and, in one case, good. But [The Market Leader of high street chain clinics] fell down on every visit when it came to explaining complications – for example, failing to explain the specific risks associated with insulin-dependent diabetes to one researcher and giving her unrealistic statistics on her chances of success. AVC’s thorough pre-surgical consultations and patient documentation clearly outline the risks. 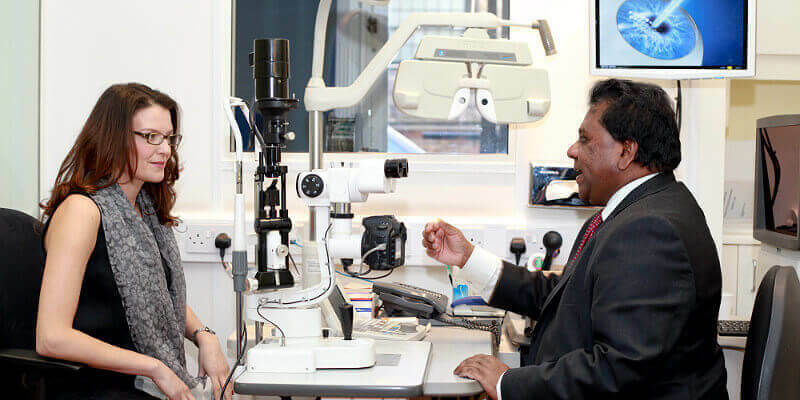 Our consultants and advisors will always answer your questions in all aspects of eye surgery, especially any potential complications. We go into detail when we outline all aspects of our treatment procedures, and this very much includes the risks and possible results. We want you to be fully away of all aspects of your laser eye surgery treatment so you can make better informed decisions on whether to have surgery or not. Which? stated that some clinics were misleading on pricing and charged for fees which were not mentioned prior to the initial appointment. For example, one high street clinic advertised pricing at just under £600 per eye, while the Which? researchers found the cheapest price for LASIK treatment was over £1100 per eye. This was from the market leader. Similarly another high street outlet advertised their pricing at just under £800 per eye, while the survey found the best price offered was over £1300. Worryingly, Which? found that some clinics, especially high street clinics, put making a sale over patient safety. At AVC, our pricing is clear including the fact we do not do ‘free’ consultations. We don’t try and up-sell products and we do not pressure you into surgery; or try to deceive you with misinformation to get you to sign up to surgery which you are unsuitable for. The survey also found that some of the information given to prospective patients was simply untrue. The leading chain clinic said their medical equipment was two generations better than the competition. Which? found this to be wrong. We say our equipment is state of the art because it is. We do not make false claims about our equipment. The same can be said of our eye surgery techniques. The Which? Survey is timely as the NHS medical director Professor Sir Bruce Keogh found a greater need for regulation of the eye surgery industry in the UK. As a result review committees are to be established. Though the high street chains did state they had tens and thousands of delighted patients, and that one in five were charged the lower advertised costs, it had no response to the more stringent criticisms of the consumer group’s findings. This includes putting sales before safety and false claims as to the quality of equipment. Price honesty – Cheapest is most definitely not the best. If one price is advertised for this to almost double at the consultation, it could be time to look elsewhere. Open and honest about risks – Do you feel some of your questions were dodged? If so, it could be time to go to a more honest eye surgery provider. Laser eye surgery is the safest surgical procedure in the world with high satisfaction rates. According to the Which? survey, clinics like our own provide the better service. When you contact us about eye surgery, we will explain to you that the consultation will not be free. That said we do not charge £250 for the consultation. We feel this is ridiculous. If you decide you want to go ahead with the surgery, providing we feel you are suitable for treatment of course, your consultation fee is taken off your eye surgery bill. All of our pricing is clearly laid out from the start. It is completely transparent. We will not try to push services or products you do not need. We are here to take care of your eye surgery, not make a quick buck out of selling you something that you do not need. Our consultations assess your suitability for surgery. We lay down the risks, we lay down what’s involved, and we try and answer your questions as best we can. Our literature is comprehensive and we try and give you our realistic opinion on how well you can see after surgery. We want you to go into your surgery with your eyes open. We have been established for ten years and our surgeons are some of the most respected in the world. At the time of the consultation each of our patients will meet the surgeon. Our methods and our pricing are ethically sound. Our procedures are tried and tested, and we would never carry out an experimental eye procedure. Sadly, we often see patients from other clinics that are less than happy with their surgery. Perhaps this is why we independent laser eye clinics fared well in the Which? survey. At Advanced Vision Care, we always treat the person and their individual visual needs. Feel free to call AVC TODAY on 0800 652 4878 about laser eye surgery or if you have concerns over the Which? survey results.